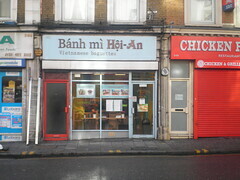 A small Vietnamese banh-mi shop in Hackney Central, also serving noodle salad and soup. As of August 2014, everything is priced between £4.50 and £5.50. They also offer various meal deals including a half baguette with soup or noodle salad for £6.50. On an August 2014 visit, Bec had the spicy tofu banh mi (£4.50), which was served with shredded salad, fresh chilies and hot sauce. It was the perfect degree of hotness — neither underwhelming nor overpowering, though extra hot sauce could be added for more heat. Though it was near closing time, the bread was fresh and delicious. I also had a traditional lemonade, bringing the total cost under £7. There is limited seating — a bench near the window with about four chairs. I don't think there is a customer toilet, however I didn't ask. Bec's verdict: A definite winner — I'd go back again to sample the noodle salad meal deal. Accessibility: Step free, but quite cramped. Last visited by Bec August 2014. Opening hours verified on that visit. Last edited 2016-11-16 21:44:20 (version 9; diff). List all versions. Page last edited 2016-11-16 21:44:20 (version 9).